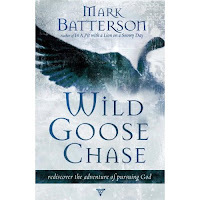 I have really grown to appreciate the leadership and writing of Mark Batterson. He is a popular blogger, pastor and just released a new book last week. His newest book is called Wild Goose Chase. Click here to check out the website for the book. Mark posted a video that he filmed last week in Scotland! So cool. The short video defines the basis of the book and the audience that he is targeting. I thought that it was a neat video and it may just give you a new angle on who God is.